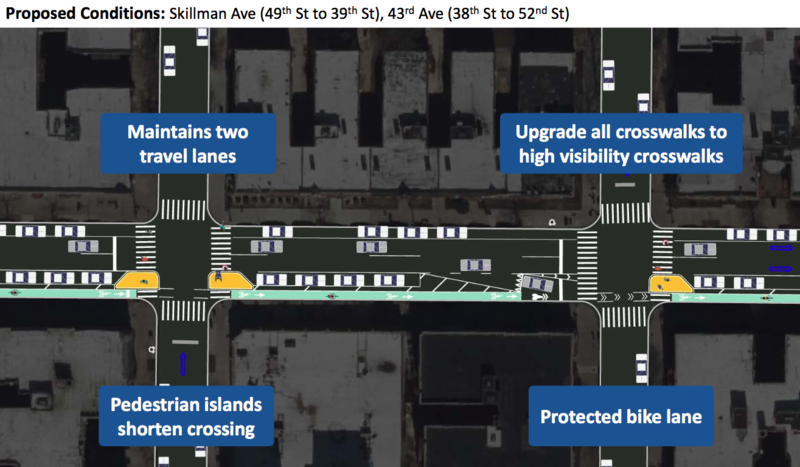 At the request of local Council Member Jimmy Van Bramer, in November DOT announced plans for protected bike lanes on 43rd Avenue and Skillman Avenue. Now the project is languishing, and Van Bramer hasn’t done anything to move it along. “One of the things that I believe we need is a protected bike lane, right here on 43rd Avenue — a protected bike lane all the way from, essentially, Queens Boulevard all the way to Roosevelt Avenue that would keep cyclists safe,” he said at the time. Seven months later, DOT delivered, presenting plans for 2.6 miles of protected bike lanes and 30 new painted pedestrian islands along 43rd Street and its westbound counterpart, Skillman Avenue [PDF]. The redesign would close much of the gap in safe bike infrastructure between the Queens Boulevard bike lane and the Queensboro Bridge. Soon after, Van Bramer and Queens Community Board 2 announced a public town hall with DOT about the project on December 19. But on December 18, Van Bramer sent out an email saying the town hall had been postponed. More than two months later, the town hall still hasn’t been rescheduled. Van Bramer, now contemplating a run for Queens borough president, has done nothing to advance the redesign he demanded in April. Instead, he’s said his support is contingent on creating a safer pedestrian crossing at P.S. 11 on Skillman Avenue between 54th Street and 55th Street. “I will not entertain any plans to change Skillman or 43rd Avenue, and even contemplate bike lanes, until P.S. 11 is taken care of,” Van Bramer said in January. In response, DOT said it will review the location for a signalized crossing or all-way stop sign. That was seven weeks ago. Streetsblog contacted Van Bramer’s office for an update on his position this morning and has yet to hear back. Meanwhile, the conditions that led to the death of Gelacio Reyes remain unchanged. One of the most important bike connections in Queens is just as dangerous as when Van Bramer called for action last year. On Sunday, Queens residents will rally at the Sunnyside St. Pat’s For All parade to call on Van Bramer to make the redesign a reality. To participate, head to 41-15 Skillman Avenue this Sunday at 1:30 p.m.
I’ll say that a safer crossing at P.S. 11 would be a good addition and the mixing zones DOT proposes for Right Turns, are a mistake and should be deleted. That will allow the restoration of a few parking spots, which is not really my concern, but would help make this proposal more palatable to the Community Board and area residents/businesses. Hopefully, DOT and JVB can find the compromise solution.